I have started doing creative ideas under the topic ''DIY" on the blog and in case you have missed the previous post, I recommend you to check it here because I'm sure you will like it. Also, I mentioned why I did start this topic in the previous post as well, which was my first post ever on the DIY topic. I got another idea in my mind that I want to do and I'm going to share with you this idea today in this post. Actually, I have done it and it was really fun doing it, but I hope you like and I really hope that I'm going through these ideas clearly and good, but if you find something wrong, please inform us by commenting down below or you can contact us through the contact page otherwise comment your opinion on it. Been thinking of doing something creative with the papers because I've seen so many people doing a lot of creative stuff and I got pretty good ideas and today's idea was one of them. Also, I did this with my family which was more fun and pretty quick. I really recommend doing it with someone because you get memories and fun moments together and finish it quickly. Also, before I start this post, I want to say that the new update which was the feedback update that I made to this blog was really good and got two feedbacks on my previous post which I did on this topic. You can say it's pretty much a good update for the future. I want to take a time to thank every one of you who support me and my blog, it really means a lot. 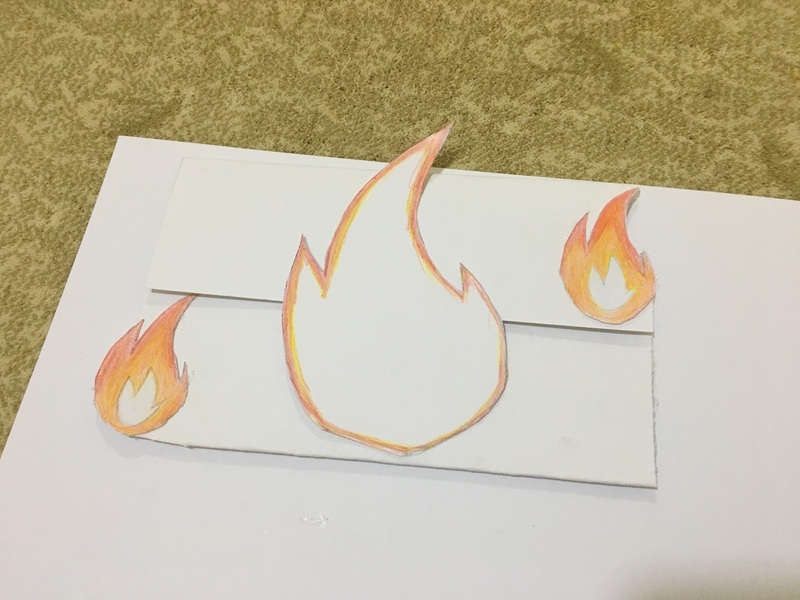 Anyway, As you have guessed by the title that we did a flame envelope and a card for gifts or also it works for a short letter for friends or family. However, I couldn't find a good label and because this is an item, I have created a label named 'Creative items' and I will include any creative item that has been made by me because I'm sure there will be a lot of items in the future. Alright, so I'm going to start walking through the process of making this flame envelope and then I'm going to do the card next. You need good bond quality papers for this idea because it's better than the normal one and more suitable for envelopes. As you see in the picture, the first step you need to fold the paper as shown in the picture above. I used the rule to lift the folded side up so you can see it because when I folded the paper it went flat and it didn't show up clear to the camera. Also, you need to measure the sides when you fold because sometimes when you fold the paper like that it won't be the same for both sides. We need to make sure that we fold it straight and perfect. I forget to take a picture of the next step which is folding the other side to make it an envelope which has a closing and opening side. But I think it's enough to mention and it's not necessary to show a picture of it because I think the result is obvious, but I'm really sorry for not taking a picture of it, for some reasons I forget to do so. This is after I did the folding for the other side and also after I finished drawing and cutting the flame. I drew and opened a small half circle in the middle as you can see in the picture above because that will help you to close the envelope. It wasn't really that perfect and as I planned, but you know, things never go as planned and that is not a problem as long as it's good. I drew the flame with a pencil as you can see it and then we erased it with an eraser before we colored it so it looks more like a real flame. I picked the spots for the flame on the envelope and you can pick your own spot if you want, but I think this looks good and just perfect. 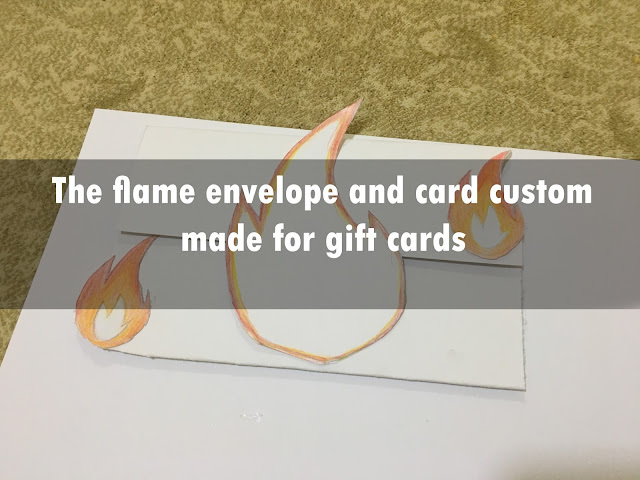 The next step requires glue to help you glue the flames on the envelope and also gluing the first fold which is the place where the card goes. Before you glue all the flames, you need to color both flames and you need three wood coloring pencils, red, orange, and yellow. Also, you need to open the half circle before gluing the main fold, because that would ruin everything if you don't do it first. You can open it with a scissor or anything that could help you to do so. I really hope I'm doing a good job of going through the process of making it. This is how it looks like after coloring the flames and also gluing it on the envelope. Also, as you can see in the picture above, I have opened the half circle in the middle which helps to close the envelope and colored it with orange. As you may notice that I have also cut the edge of both flames and the envelope to make it look better and more like a flame. You can do more stuff to the envelope such as coloring the entire envelope with suitable colors or coloring the edge of the envelope, but we did nothing. This is the final result and as you can see, I have colored only the edges of the card and that makes it more like a flame. The card might be as the envelope size, but you can pick your own size if you want to make another size, however, this is the recommended size because it's the best for a gift card or letter. Alright, I hope you enjoyed this idea and would like to know your opinion on this idea and may as well give this post a feedback with the new update that I did for the blog. You can find it at the bottom of each post, and also would like to know how I did with walking through this idea I hope I did well. This is a pretty creative way to make letters. The awesome part about it is that if someone wasn't a fan of flames, they could replace the clames with nearly anything using your idea! Thank you so much, Thats true!! This is such a cute idea! I always forget to grab a gift card holder, so this would be great! I love that it adds something personal to something that's not usually quite so personal. Homemade cards and so nice and homemade envelopes make them even more special. Thank you for the new ideas. This is so cool and creative. You did an awesome job! What a great job! This is cool! Such a creative idea, I love it! Thank you for sharing this, I will try to recreate it. I love sending greeting cards but don't have the time to make handmade cards like I used to when I was little. I love how you put together those greeting cards. They are pretty awesome. I wish I could do something like this. I'd love to get a card like this or maybe even make one. I love things like this so much more than mass produced sentiments. Well done! such a wonderful idea! homemade cards with homemade envelopes, i would be thrilled to receive these! Such a unique idea and a great way to spruce up a card!